This is the point that I love. Nothing has gone wrong, nothing is cut too short or puckered or shrunk unevenly or accidentally the wrong way around. The bubble has not been burst. 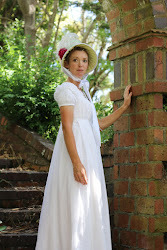 After finishing what I considered to be a complete 18th century woman's costume, I was on to making a man's costume next. In this instance, everything went according to plan, mostly because I had already made all the mistakes with a practice shirt. 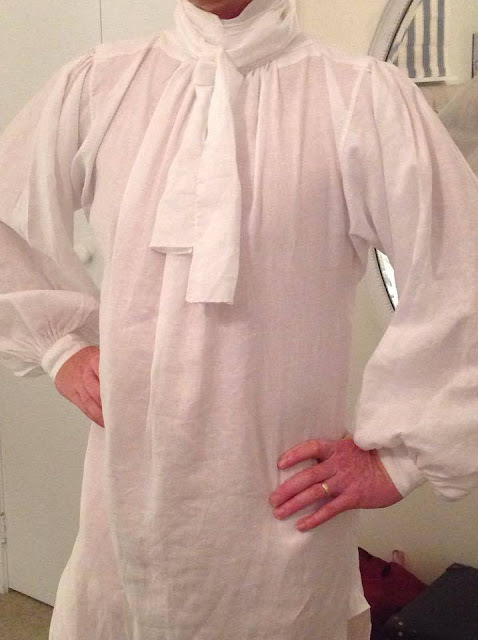 So here is how I made my first linen men's shirt. Before I begin, I'll give my husband credit: My husband is the best husband in the world. Sorry ladies. It's true. He let me make him this shirt, and lets face it, he was earning BIG brownie points. My husband is a gardener. He has no interest in historical clothing, nor dressing it in. He runs up and down mountains and does marathons and goes to the gym at 5:30am...he is not, however, like many of the delightful spouses I see on blog who allow themselves to be costumified. So yay Mr Persson. You are a saint. I used this pattern, which I found good (I'll review it in my Pattern Review page). I had to decide on sizing for my own 6'1" 87kg man, as well as the fact that nowadays linen is usually 140cm wide, not the narrow width described in the pattern. The point of the pattern is to minimise waste, so this is what I came up with. You could find a better way, even cutting it across the width and sewing up shoulder seam, which in all honesty will only be about 5-10cm long! I made the cuffs and collar slightly wider than the pattern recommended, as it seemed nicer to my eye. That may be historically incorrect, but as this shirt pattern hardly changed in 200 years, I'm sure I can find a period in which cuffs and collars were wider! All seams are 1cm and finished flat-felled. Insert your underarm gusset (I've included instructions here), and sew up under-arm seam from gusset to wrist, leaving 8cm open at wrist end. Double turn a narrow hem at wrist opening and stitch using a running stitch. Here's a great article with a picture of the ordering of flat felling a sleeve gusset to avoid puckering. And here is another. Fold cuff in half lengthwise, sew narrow seams with a running stitch, clip, turn, press long side seam allowances inside. Gather the wrist end of the sleeve until it matches the finished length of the cuff (23cm in this case). I wanted quite a formal look, so pleated the wrist in this shirt. Insert this seam allowance into the cuff, and pin firmly, but be careful not to catch inside of cuff. From the outside, sew using a whip stitch. I sew my whips straight across, one for each pleat. If gathering, just make sure that you whip in small stitches to ensure your gathers lie smoothly. Outside - pleats whipped to cuff. 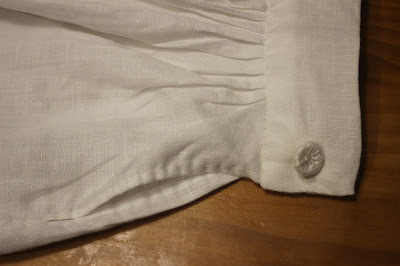 Then turn inside out, and pin the inside of cuff to pleats. Whip the cuff down, making sure that the stitches fall on the cuff side of the outside seam or they will show on the outside! 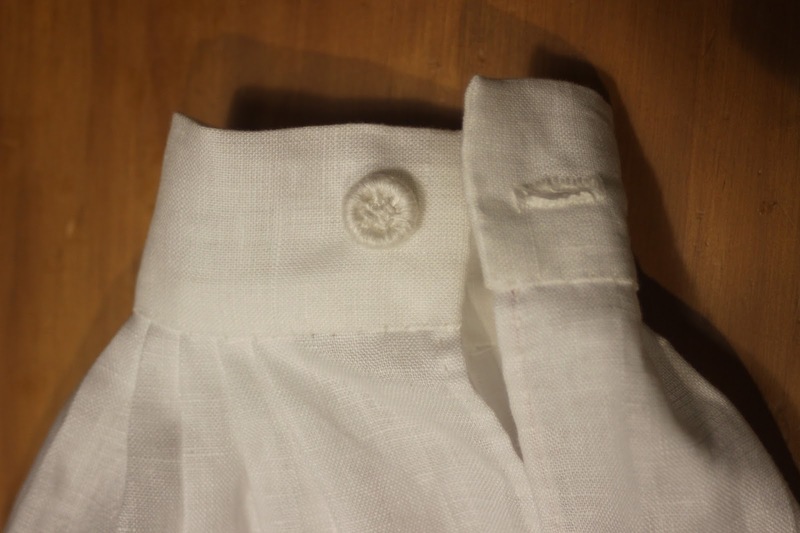 To complete your sleeves, sew on a button (I did dorset buttons, using this tutorial - they look very smart! NB I only used about 30cm or less for each, not the 2m stated! Maybe I did it wrong...) and a corresponding button-hole. One of the great tips I got is to complete each area - sleeves, cuffs, body - separately if possible as it will save you having a whole great garment on your lap, especially useful when sewing a huge dress! 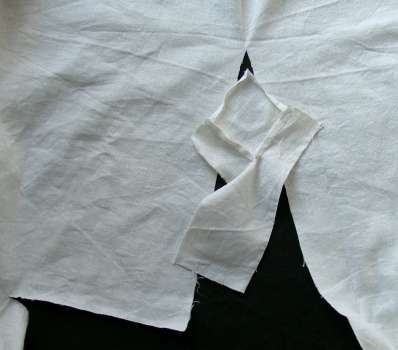 Fold the main body in half so that the front is about 5-10cm shorter than the back. Mark the shoulder line, as well as the centre front. If you cut the body across the width, sew up the shoulder using a flat felled seam to these same dimensions - 5-10cm from shoulder edge. This will make inserting the shoulder gusset harder, unfortunately. Cut across the shoulder line 25-30cm (larger slit=more gathers. smaller slit=wider shoulder) either side of the centre front, and then cut the chest opening 15cm down the centre front. 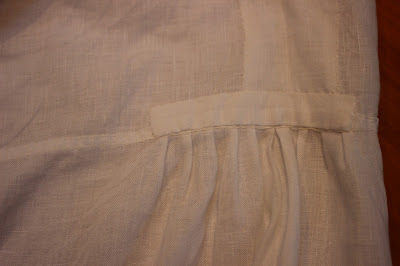 Double fold a narrow hem (6mm) on chest opening, using a running stitch. Cut out the little heart-shaped piece of linen, fold under the seam allowances and whip to the end of the chest opening. This will strengthen this area that is prone to tearing. Cut a 6cm slit lengthways into the middle of the shoulder pieces. Stitch half of the gusset into this slit, either running or backstitch, leaving the other half free to be attached to neck opening. Here is a great photo by Marquis of the process of inserting the shoulder gussets into the shirt. Now you will create a larger, rounder neck opening. Sew the free half of the shoulder gusset into the end of the shoulder split, RIGHT side of gusset to WRONG side of shirt. The seam will be on the outside. 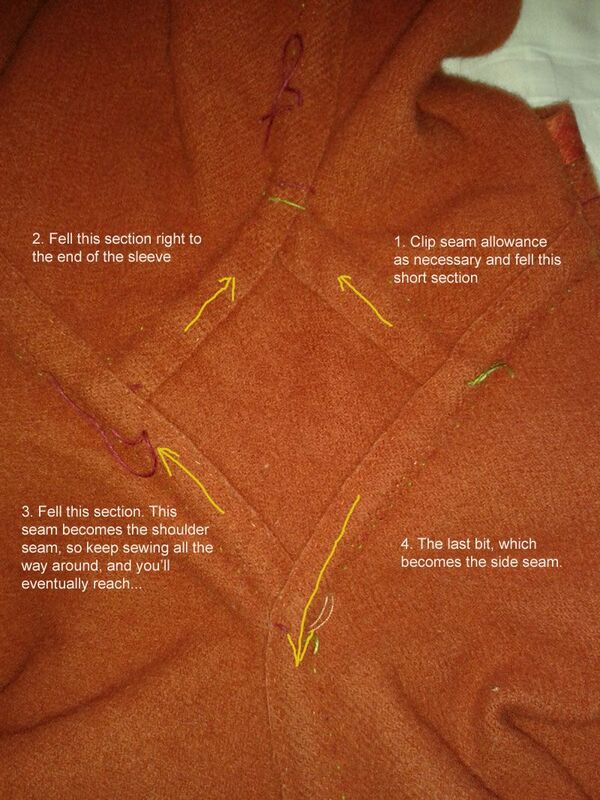 Flip the gusset onto the outside of the shoulder. Press the seam allowances under and whip the gusset over the top of the shoulder, thus strengthening an area which gets a lot of strain. Follow the same procedure as you have done with your cuffs. Fold collar in half lengthways, sew short ends. Trim, turn and press under long seam allowances. Mark the collar into quarters: this will mark shoulder centres and centre back. 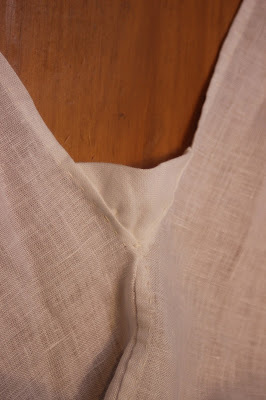 Gather neckline, or pleat as I have done, and then insert into the collar. Whip down first outside, then inside of collar, securing each pleat firmly. I didn't pleat over the shoulder gussets as they were double thickness and I felt lay better that way. If you are gathering, this should be easier and you can gather the entire neckline. Complete by sewing on 1-2 buttons and corresponding button holes. Mark on the side body 30-35 cm down (I used 32cm) to show where the sleeve will sit. Mark again on the side body approx. 30cm up from the front hem, where the side slit will go to. 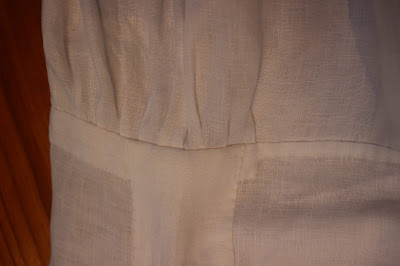 Sew this seam between these marks, using a running stitch. Finish flat felled. 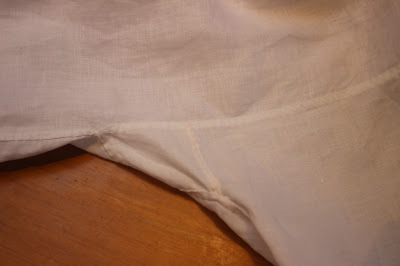 Double fold a narrow hem on the side splits, using a running stitch. I admit I didn't quite know the procedure for insert the side slits gussets, so these were folded in half to form a triangle and then stitched to the top of the side split. Double fold a narrow hem and stitch using a running stitch. Gather (or pleat) the top of the sleeve - approximately 10cm - so that it fits into the opening left by the side seam. Pin this into the body and adjust the peats/gathers accordingly. Sew this in using a backstitch, and flat fell. I found the sleeve head to be messy, so cut a small facing which I stitched over the plates inside. Yes, its a 21st century idea to have neat and tidy insides, but there you go. What can I say? 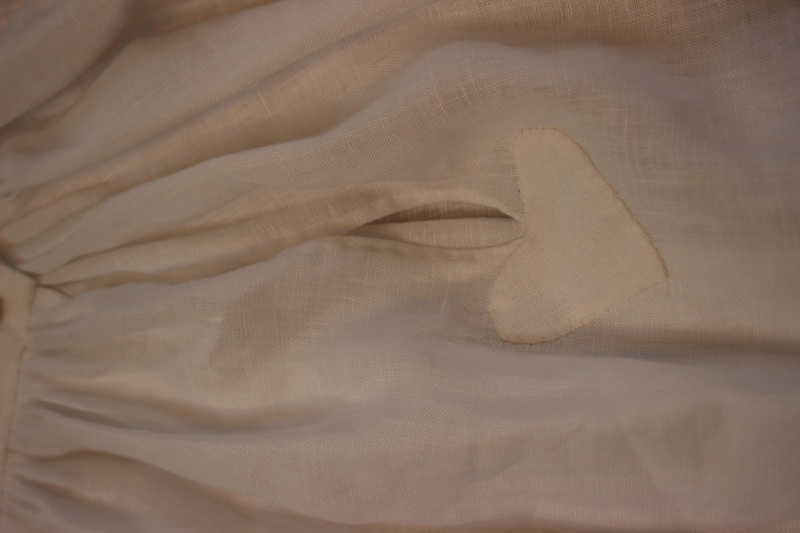 As always, sewing with linen is a pleasure, as is sewing with linen thread. I didn't wax it, as I'm told I ought to. Perhaps it's just a particularly course linen thread? I don't have anything to compare it to.